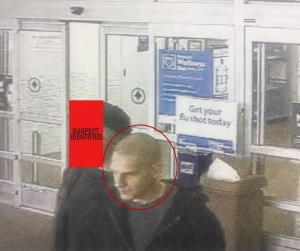 Walmart Supercenter located at 1201 Grindstone Parkway reported shoplifting after two males entered the store, retrieved merchandise, and left the store without paying for the items. A few weeks after the incident, one of the males was identified and arrested. The second male has not been apprehended yet. Video turned over to CPD shows the man in the circle as the possible suspect. If you have any information regarding his identity or whereabouts, contact CrimeStoppers.